Taste test: These chips have a nice texture to them and taste like the chicken flavoring in bullion cubes, or the chicken flavor packets that come with ramen noodles. It's a good, strong flavor. If you eat a whole bunch of these at once, you will get thirsty, so it's recommended that you have a beverage handy. Smell test: Smells like roasted chicken. From the package: “Croustilles Saveur de Poulet Rôti” ... “Chacune de nos croustilles regorge de saveur!” ... “Extra flavour on every chip! You know when you're eating a bag of chips and you get that one chip coated with so much flavour that your taste buds to a little happy dance? Well, every single Rave chip is just like that. Using the latest in taste technology combined with a little TLC, we cram extra flavor on every Rave chip — often twice as much as lesser chips — so you get more pleasure with every bite. 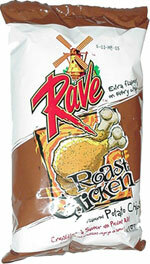 Rave — for people who crave extra flavour on every chip!"